The bloodhound is a gentle, mild-mannered breed of dog, although it can also be stubborn and requires firm leadership and training to become an obedient pet. 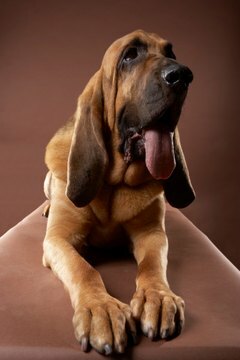 The bloodhound has a reputation for being friendly and patient with children, although each dog is different. A bloodhound might attack a person or another dog for a number of reasons. Prevent your bloodhound from becoming aggressive by fulfilling its needs as a dog. A bloodhound that has not been show adequate leadership will view itself as the alpha dog of the family. This means that it is then more likely to exhibit dominant behaviors, such as growling and snapping at other family members. Show your bloodhound that you are the pack leader by feeding it after the family has finished eating as it knows that alpha dogs eat first and subordinates eat second, according to PetCareEducation.com. Make the bloodhound sit and wait quietly before giving food or affection. Do not allow the dog to sleep on your bed or jump up on furniture as these a positions of dominance. The bloodhound breed was developed to track a scent over extremely long distances and because of this the dog is energetic with high stamina. If this dog does not get adequate exercise it will become frustrated, which could cause it to become aggressive. Prevent this by taking your bloodhound on a long walk every day. Once your dog is fully grown take it on long hikes regularly to allow it to drain its excess energy. Keep it on a leash as it will wander off once it catches an interesting scent. Position yourself slightly in front of the dog while walking to encourage it to see you as a leader rather than a follower. The bloodhound should be socialized while it is young to prevent it from becoming aggressive towards unfamiliar people and dogs that visit the house. The bloodhound can be protective of its home, which means that it is more likely to attack unfamiliar guests or intruders. However, the breed is generally friendly toward people and dogs when it is outside the home, according to the Dog Breed Info Center. Enroll your bloodhound in obedience training classes while it is still a puppy to allow it to meet lots of different people and other dogs. When a dog is about to bite it shows physical warning signals that show that it is about to snap. Being able to read these signals can help you and your family to avoid getting bitten by your bloodhound by avoiding eye contact and back away from the dog slowly. The signs include a stiff-legged walk, tail held high and stiff and a fixed, focused expression combined with silence and a tense, motionless body. Your bloodhound may show these warning signs if it is unhappy with the way it is being treated, for example having its ears pulled by a child or if it is touched in an area that triggers pain. Take your bloodhound to a veterinarian to see if it is suffering from an underlying medical condition.